A modern recreation of the classic German field cap. Very much like the old Bundeswehr cotton model and the Wehrmacht model 1943, but black. Unlike in the older BW issue version, the flaps can be folded down for extra protection and dumb looks. 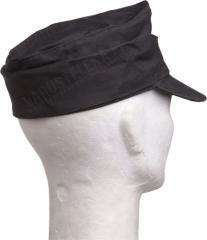 With the flaps buttoned up, this is probably the best looking "ski cap" you'll ever meet. Add proper goggles on the front for that mountaineer effect. Made of 100% moleskin cotton. Wash in 30 degrees celsius. Modern reproduction. 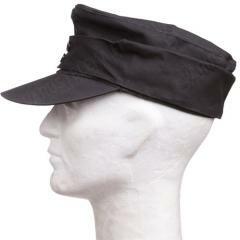 The post-war Germans never used black cotton field caps. My hat size is 58, I ordered a size 58 and it fits perfectly, nice and snug, it definitely won't fall off accidentally. Looks and feels nice, construction seems solid. 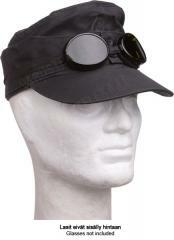 The visor is also quite rigid. A great deal for $10. Yllättävän hyvä lätsä ollakseen miltecciä! Kangas on kestävää, hyvän tuntuista, koko on just oikea ja kaiken lisäks kotsa pitää muotonsa vallan mainiosti. Mä oon käyttäny tätä nyt kai kaks vuotta melkosen aktiivisesti SRA-hommissa aivan joka kelissä pakkasesta sademyrskyjen kautta polttavaan helteeseen ja vasta nyt rupee väri haalistumaan kaiken sen hikoomisen ja auringossa olon takia. Jos hakee hyvää lätsää halvalla, niin tää on ehdottomasti mun suosikki. Ostakaa, ostakaa! Kiva ja tyylikäs lakki silloin kun pitää mustia tai tummia vaatteita! This is exactly what I expected, it fits well, it keeps the sun out of my eyes, it's comfortable, and I love the way it looks. Fits nicely - the 59 hat size was perfect. Solid brim that takes, and holds, a good crease for a jaunty, field-worn look. Would love to see this hat available in other colours in this material (already bought the heavier wool version). Ihan mukava lätsä. Sain lahjaksi ja olen käyttänyt. Matsku on kyllä oikeastaan aika höveliä. Langanpätkiä törrötteli ja puskee esiin saumoista tuon tuostakin - niitä saa sitten olla trimmaamassa. Ajattelin, että käytön myötä tästä muotoutuisi sellainen kivan kenttähenkinen ja rähjääntynyt, mutta ei ole tässä viiden vuoden saatossa muuttunut miksikään. Great cap! Ordered a size 58 ( 7 1/4 in US size), A little big,Washed it in cold water and dried it on low setting in the dryer and it fits perfect! I hope someday it's available in olive drab and I would purchase another! Fast and friendly service is why I do business here! My head is a size 57 and I ordered a 57. Fits like they made it especially for me. Snug, but not tight, and I can wear it all different sorts of ways, and it looks good, and sits on my head just right. Well made, it seems. I wonder what they used for the peak/visor. One guy said in his review that he washed it so I guess it isn't cardboard. Probably plastic by the feel of it. Either way, should hold up to some years of use. What I like as well is that the peak comes straight, so that you can form it yourself. It came well packaged, and is brand new. No wetness or dirty stuff anywhere. Not even a loose thread! The flaps for dumb looks work really well too, never looked so ridiculous! Everything as described. The size is spot on. 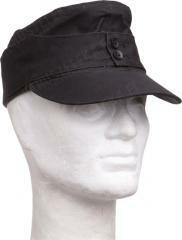 Nice cap for a walk in the woods or a hike in the summer. The precise size and high-quality label are features usually reserved for more expensive headgear. Label and tag only mention Germany; China is not mentioned, but then VW didn't mention smoke in diesel exhaust. If you want a high-quality hat made to German standards for the price of a hamburger, you won't be disappointed. I bought it for the neck flap! Here in New Mexico, it's not unusual to find yourself under desert sun, maybe even more often than when in Finland where the neck flap is only for dumb looks! In New Mexico, it can be a burn saver. Some hat designer at Sturm (owner of Mil-Tec) really went to town on the flap, incorporating two loops hidden in the fold to reduce the dorkitude of flap use. While I'm not 100% comfortable looking like an extra from Raiders of the Lost Ark, this hat is high quality and a good desert alternative to a cowboy hat. The quality of mine is superb with no loose threads whatsoever. A steal at the price. 61 lakki 60,5 koon päähän on oikein mukavan napakka ilman että puristaisi liikaa. Kangas on ihan ok paksuhkoa, lippa on hyvän jäykkä. Viimeistely tosiaan taattua mil-tecciä, esim. "hupun" päädyt on kyllä ommeltu kiinni mutta kääntöpuolen kangas on päättelemätön joten purkautunee ompeleisiin saakka, tosin ei kai kukaan tätä avonaisena käytä edes vitsillä. Mitään erillistä hikinauhaa ei löydy. Ihan särmän näköinen ulkomuoto.